If you’re looking for a good, fast-paced read, Recovery Road is for you. This messed-up romance is really one of a kind. The story starts with Maddie, a teenager with a pretty big background : she’s in rehab, because of her history of drinking and, well, hitting things a little too much. We follow her story, from her recovery in rehab, to her back to school, her going away to college…for that, the title of the novel is well given : we truly see the road that leads her to recovery. It’s a bumpy road, of course. She meets some obstacles, she faces some challenges. And, for that, I wasn’t disappointed. This is what i mainly liked, as I read this book : it’s really interesting to see the whole journey she goes through to recover. And it is a long journey, since the novel goes through a few years, in 300 pages. It is a love story, too : Maddie meets Stewart in rehab, the spark is there. Even though the synopsis makes you think it’s the main focus of the book, I definitely didn’t see it that way. Maybe it’s because I couldn’t relate well to the characters, whether it’s Maddie, or Stewart, or anyone of Maddie’s friends. I focused on the journey she was going through, but I was lacking a little bit of the background story. Some flashbacks of her life before would’ve ponctuated the story and given maybe a little more depth to the characters’ story. Despite these little drawbacks, Recovery Road kept me reading and guessing until the very end, the relationships between the characters may be lacking a bit of depth, but I found myself caring for some of them -even if, to be honest, I quite didn’t root that much for the main relationship between Stewart and Maddie. Moreover, Maddie is a one of a kind character : she’s no heroine, she’s not that courageous or flawless, she’s just a really, really messed-up teenage girl trying to make it through the day. She goes through life with clenched teeth, and a lot of sarcasm, and it was a nice change. 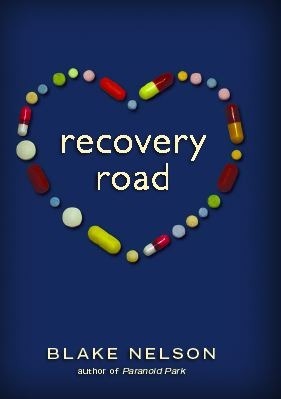 Even if i would’ve enjoyed more depth into the characters’ stories and feelings, Recovery Road was a good read with an interesting view of the bumpy road ahead of everyone with an addiction. Some make it through, others don’t have that luck. And it may be not that joyful, but it’s real. Blake Nelson, Recovery Road, published by Scholastic Press, February 24th 2011. Madeline is sent away to Spring Meadows rehab for drinking and rage. At the weekly movie night in town, she meets Stewart, from another rehab nearby. They fall for each other despite the crazy time. Madeline gets out and starts to regain her feet. But when Stewart joins her, both still are severely troubled, and he is getting worse. Nanowrimo : I tried, I failed, so, what ?